Solebury School Athletic Center │ Solebury School │ Photo by Albert Vecerka │ ESTO. The Athletic Center furthers the experiment started with the Abbe Science Center, transforming the School’s historic character with new buildings that respond to the pastoral site and vernacular architecture of the region. Set apart from the nuclear campus, the site design foregrounds the building on two sides with playing fields and gently rolling meadow. The site orientation reinforces the dialogue between the athletic center and the heart of the campus through placement of the west-facing entry. Parking for cars and buses is tucked behind the building. Human scale and proportion are considered in the arrangement of spaces and pedestrian access. The larger volume is set as a backdrop to the playing fields, while the smaller volume defines the footpath from the parking area. At the intersection of the two primary pedestrian axes is the main entry. The entry and fitness volume is a cedar-wrapped linear bar along the west elevation, with views back to the campus and to fields beyond. It is framed with wood beams, recalling the school‘s prior gym which was an early pioneer in the use of laminated wood timber construction. The two-story gymnasium includes a court area for compe-tition basketball or volleyball with bleacher seating for 300. It can also be reconfigured for parallel practice games of basketball, volleyball, and badminton. This ground-faced masonry block volume is articulated by a polycarbonate clerestory band on the north wall to allow for natural day lighting with minimal glare. Interior walls are clear-finished oriented strand board panels. Adjacent to the gymnasium is a one-story section with a multi-purpose room for wrestling and dance, as well as concessions and locker room suites. Contrasting with the larger volume, the one-story section is wrapped in deeply colored fiber cement panels. The $7.5-million project includes a 22,000-square foot gymnasium, 400-meter six-lane track and playing field, site work, and 7,000-square-foot maintenance building. It was completed in December 2007. West Elevation + Entry. Photo by Albert Vecerka │ ESTO. 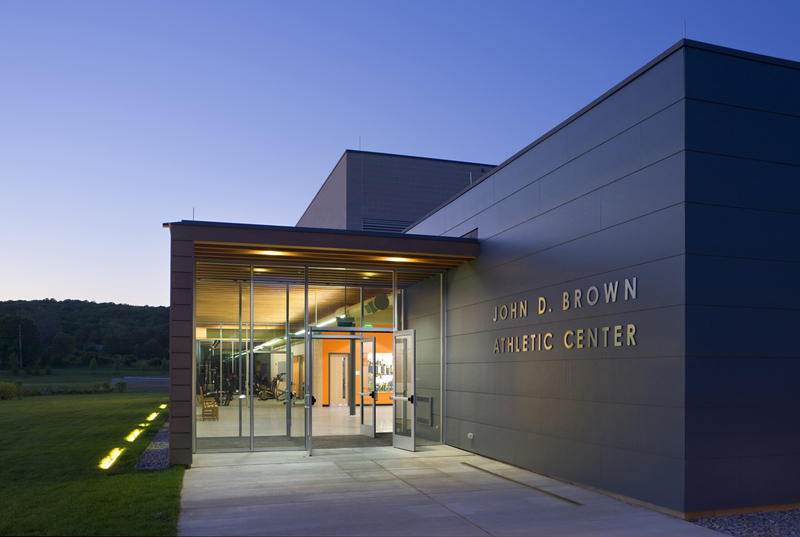 Solebury School, John D. Brown Athletic Center. Photo by Albert Vecerka │ ESTO. Entry + Gathering Area. Photo by Albert Vecerka │ ESTO. Gymnasium. Photo by Albert Vecerka │ ESTO. Dance Studio. Photo by Albert Vecerka │ ESTO. Fitness Center. Photo by Albert Vecerka │ ESTO. John D. Brown Athletic Center Floor Plan │ Image by Bradley Walters. West Elevation. Photo by Albert Vecerka │ ESTO. Architect: RMJM (formerly Hillier Architecture), 500 Alexander Park, Princeton NJ 08543-6395 | Tel. 609.452.8888 | Fax. 609.452.8332 | www.rmjm.com. Principal-in-Charge + Lead Designer: Barbara A. Hillier; Designer + Project Manager: Bradley Walters; Designer + Project Architect: Jennifer Akerman; Senior Technical Architect: Michael Levin; Signage: Despina Raggousis. General Contractor/Construction Manager: E. Allen Reeves, Inc., 1145 York Road, Abington, PA 19001 | Tel. 215.884.2255 | Fax. 215.884.7059 | www.eareeves.com. President: Robert N. Reeves, Jr.; Project Manger: Daryl Boorse; Project Superintendent: Jared Giles; Project Estimator: Samuel Moore. Photography: Bradley Walters, Jennifer Akerman, Albert Vecerka | ESTO | www.esto.com. Fisher, Brian and Peter Baron. “Inside Solebury School: Insights From a Recent Grad,” Admissions Quest: Boarding School Blog, http://www.admissionsquest.com/onboardingschools/2010/10/inside-solebury-school-insights-from-a-recent-grad.html, 27 October 2010.